Join us for this week's Musicians Show with guest Max Johnson. 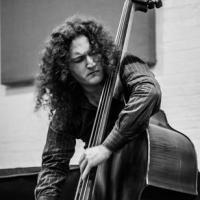 Based in New York city, Max Johnson is a bassist, composer, and bandleader. His four albums as a leader, Elevated Vegetation, The Invisible Trio, The Prisoner, and Quartet have been praised by the New York Times, NYC Jazz Record, and JazzTimes. His latest release entitled Big Eyed Rabbit is the debut album of a collaborative trio with Ross Martin and Jeff Davis. Max began performing during his time at the New School for Jazz & Contemporary Music, where he studied bass with Henry Grimes, Mark Helias, and Reggie Workman among others. Max also began establishing himself as a figure in the bluegrass scene during his time at the New School, a genre that he cites as influential in his career as an improvising musician. Since then, he has performed with John Zorn, Anthony Braxton, Muhal Richard Abrams, Candido Camero, William Parker, Butch Morris, Karl Berger, Bobby Sanabria, Sylvie Courvoisier, Erik Friedlander, Mary Halvorson, and many others. Tune in this Wednesday to hear Max discuss his music, career, and influences.